I recently wrote about why booking fees are important, where I explained how booking fees brought a transparency to ticketing that helped the consumer to make informed purchasing decisions. So it seems a little contradictory to be writing this week that we should end booking fees. But, whilst I stand by what I wrote, I really don’t think that transparency is enough to gain the confidence of the ticket buying public. Although that explanation may help consumers understand why there are booking fees, it won’t convince them that they aren’t being ripped off. As I said, no one likes booking fees – given the choice ticketing companies would get rid of them if they could. After all why have a policy that so infuriates your customers if there was another way? There is no need to unnecessarily alienate so many people with outdated policies and unjustifiable charges. Ticketing never receives positive headlines. It is never going to be a popular industry, and at best it is just a necessary evil in order for fans to access their favourite artists, sports people, shows or events. And when demand outstrips supply, it is the Ticketing Industry that bears the brunt of the public’s wrath. End the blanket “no exchanges and refunds” policy. This is a policy formed entirely out of self interest. The theory behind it is that once a ticket is sold, decisions about marketing and pricing as well as operational decisions are made on the basis of that sale. So if an event has sold 1,000 tickets then the organisers will make financial decisions based on that volume of sales. If 500 of those tickets were to be returned, then those decisions may no longer be the correct ones and may cost the organiser money, particularly if those tickets are returned at a time too late to resell them (or after the advertising budget has been spent). This is all well and good and are legitimate concerns but there must be an alternative that can meet those concerns without alienating customers. Because, for customers, this is a serious issue. In most other areas of retail a customer can return an unused product if they have changed their mind – as a minimum to exchange it for another product or a credit note. The Ticketing Industry is already given protection in the form of exclusion from the Distance Selling legistlation that allows consumers a 14 day window in which to change their mind and get a refund, so the blanket refusal to allow exchanges often leaves consumers with an expensive purchase, when other circumstances may be preventing them from using it. This has long been deemed an Unfair Term or Condition by the UK’s Office of Fair Trading. Rather than a blanket ban, if customers are allowed to exchange their tickets for an alternative date, for a fee (recognising that there is an admin. cost) within a set time period (recognising the concerns of the event organiser) then not only is the customer happier, but it might also make them more confident about booking in advance. When there aren’t alternative dates there should be a resale option which offers to resell tickets on behalf of customers (provided that all other tickets are sold etc.). Be transparent about the secondary market. Currently the refusal to provide exchanges or refunds only provides fuel for the secondary sites such as Stubhub or Viagogo. By offering official resale channels (at face value with nominal admin. charges) they would eliminate the need for people to go to these secondary sites. This is important because the Secondary Ticketing market is one of the biggest causes of public resentment towards the Ticketing Industry. A ticket is one of the only products where it is more expensive to purchase online. In a free market economy people should be free to buy and sell tickets at whatever price they wish to. But there needs to be transparency about who is selling the tickets, particularly if they are coming from event organisers or primary ticketing companies. Those event organisers who do not wish for their tickets to be sold via these sites should stop the supply of them, not punish the customer who bought the tickets by cancelling them. One of the bug bears of consumers isn’t the existence of booking fees, per se, but it is the layering of fees (facility fee, booking fee, print-at-home fee, transaction fee). The reason why ticketing companies do this is to make the individual components appear smaller, rather than just having one, bigger fee. They should just bite the bullet and be honest about what they want to charge when people buy tickets. Or rather still, we should just eliminate fees altogether. Ticketing fees should all be absorbed into the ticket price with ticketing companies buying tickets from event organisers at a negotiated wholesale price and sold at or around an agreed recommended retail price. Ticketing companies can negotiate their margin based on a mixture of volume and distribution opportunities, without it being played out in public – confusing and causing disillusionment in ticket buyers. This is what the public wants and as a service industry this is what we should give them. However, for the public it will be a question of being careful of what you wish for because there will be two direct consequences. 1. It will make ticket buyers more vulnerable to being ripped off by rogue companies (see my previous post). The industry will also need to be much clearer about who are legitimate, authorised sellers and what consumers should expect to pay for different tickets. 2. It will put prices up for everyone. By eliminating booking fees it won’t eliminate the charges that sellers want to impose on ticketing. By absorbing these within the ticket price, it will only raise those prices for everybody. This will particularly be felt by those who buy tickets via sales channels that don’t currently incur booking fees now (such as in person sales at the box office). The current face values would likely become wholesale prices with retail prices being 10+% higher. The higher ticket prices would then mean that a lot of the wrath of the ticket buying public would then move to the event organiser. Which is why, in reality, none of these things will actually happen. You see, whilst not perfect, the Ticketing Industry is really the fall guy for event organisers. They, rather than the public, are its paymasters. They are the ones for whom the Ticketing Industry provides a service. The Ticketing Industry takes the blame and the public flack for the decisions of the event organisers. It really makes very little difference to the Ticketing Companies whether there are refunds or exchanges. Yes there is are some administration costs to doing so, which can be covered, but actually they pale into insignificance compared to the cost of dealing with the consequences of that policy from handling complaints right through to the reputational damage. A senior executive at a ticketing company told me recently that after a customer had complained so much they decided to refund the customer (at their own cost) in order to resolve the issue. The customer then tweeted that they had received a refund. Having read this, the promoter contacted the ticketing company demanding to know why a refund had been made without his permission. From a ticketing company’s point of view it would make life easier, enable them to have better relations with their customers and gather more data from additional customers (a consequence of reselling tickets), if event organisers allowed refunds / exchanges. It is an open secret that some event organisers supply tickets directly to the secondary market in order to boost their income. The cloak of anonymity then allows them to decry the practice in public and lambast the Ticketing Industry that allows this to happen. All ticketing companies would choose, if they could, not to have booking fees. It is the event organiser that decides otherwise. They are presented with the costs of ticketing and then choose to pass those costs on to their public (blaming the ticketing industry on the way). Of course, they should view the cost of ticketing as just another cost of putting on the event – they wouldn’t expect the customers to buy a ticket to an event with an additional lighting charge to pay for the costs of lighting that event. ..it is time for us all to engage in some sensible, adult, conversations and to make some changes.. So whilst the Ticketing Industry may wish to better serve the public it will often find that its hands are tied by policies which aren’t theirs but those of the people who have engaged them to sell tickets. Many event organisers will say that they don’t have any choice and are unable to change the way tickets are sold because they don’t have enough clout on their own to take a stance. That may well be true but if we, as a live entertainment industry, continue to alienate those people who support our businesses by buying tickets, then we risk biting the hand that feeds us. And, if the Ticketing Industry really wanted to make a difference it could take a stance and demand a better service for their customers from event organisers. Whoever takes the lead, it is time for us all to engage in some sensible, adult, conversations and to make some changes that ensure that it is the events that make the headlines, not the ticketing. In our recent poll “Is it ever right to charge for Print at Home” only one respondent said yes. So, it was a small industry-insider voluntary sample, but really, can a venue ever be justified for charging for the customer to do all the work, using their own paper? During some recent usability research we were carrying out, we found venues that charged a booking fee, a convenience fee, and then an additional print at home fulfillment fee. I guess a straight $10 charge on a $27 dollar ticket would make us think, but incremental charges help some push the basket cost to lofty heights. This post is not about such skulduggery, but more about vendors responding to venues needs, even if they personally don’t agree with the purpose. David Leek from PatronBase got in touch in relation to the poll and some work they had recently added to their system. They have added the ability to charge a fulfillment fee for collection as well as print at home, in addition to their provision of per ticket, percentage and flat rate fees, all possible to be set-up at a system or production/perfromance level. “It is not up to us as a supplier to decide if this is an appropriate course of action for an organisation (and by looking at the survey results we can see it is in the minority of opinion at the moment) but reacting to our clients’ needs is a fundamental aspect of PatronBase, so we’ve enabled the functionality for all our clients should they want to use it. This is by no means a new process for PatronBase, who were one of the first out of the blocks to respond to the UK Advertising Standards Authority rulings on fees and provide Committee on Advertising Practice (CAP) compliance to their customers but allowing venues to choose how exactly to display pricing. There is a clear line between ‘best’ practice and choice. Like so many things within the ticketing system, venues will choose to use features differently. If they feel the need or desire to charge for print at home, who are suppliers to stop them? As the saying goes, the customer is always right! Innovation is a good thing, but I sometimes worry about what is the motivation driving it? Sitting in yet another conference session where service providers have identified that, because people want to buy tickets and have to pay for them, and we need to sell those tickets, that there is money/margins to be taken from our transaction chain, I have to ask if all this is really necessary? TheTicketingInstitute generally welcomes innovation, including in payment methods and on new devices, creating new channels, especially if they make it easier and quicker for customers to buy. Yet too often there is a sting in the tail. One ‘solution’ being touted did provide a new way of listing ticketed events, combined with one click purchase, and the ticket purchaser “only paid a 1.50 euro booking fee” and the seller a 10-15% commission. The switch to the smartphone is seeing a race to provide effective secure, minimal input, purchase solutions, with banks and their competitors bringing out alternative solutions, swiping, near field, account based, etc. Apple are clearly in a significant position here, and integrating that with Passbook will give them an advantage, if venues accommodate to it. The questions will all be about charges. But in an ideal world, venues and their solutions providers want to keep it simple. Why can’t the payment gateway providers extend to offer a variety of tools within a single suite to accommodate the obvious payment methods, including credit card one-click purchase on smartphones? Ironically, the latter is one of the most secure payment methods since the device ID is communicated along with the customer’s details. In that conference session referred to above, PayPal were again advocating their solution, as an alternative to Visa and Mastercard channels. Yes they have now improved their protection for sellers and buyers to bring it nearer to that of the credit card providers, but they still treat tickets and their sellers as “intangibles” with less protection. Of course, with their App they are targeting young mobile consumers so venues may need to offer that payment channel. But the question must be: how much is being taken out of the income supposed to be in the ticket price? To fee or not to (display) fee – that is the question. I cannot be the only one who looked with a mixed viewpoint on the Committee on Advertising Practice (CAP) guidance following on the UK Advertising Standards Authority rulings on fees. At the time, working for a system supplier, I thought “Gee, we need to get on this straight away” – followed by some eager venues calling the help desk with demands to know what we were going to do to help them comply, not an entirely easy job. From someone who when he speaks at conferences highlights the fact he dislikes add-on ticket fees, you may think I should have been celebrating. However, as much as I dislike fees, it is the unclear information around fees, either when they are to be charged, how much they are, or to what transactions they will be applied, that annoys the public, me included. as much as I dislike fees, it is the unclear information around fees, either when they are to be charged, how much they are, or to what transactions they will be applied, that annoys the public, me included. So here are some ‘to fee or not to fee’ scenarios and their, in my view, compliance. The corner shop / pub. 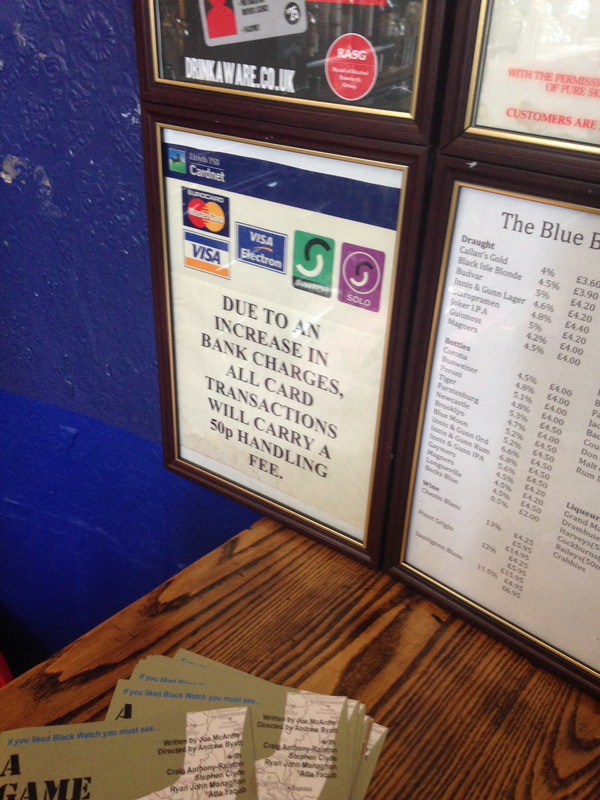 Sign on the cash register, telling you that all credit and debit card transactions under £10 will be subject to a 50p surcharge to cover bank fees they incur. To avoid such a fee, I often add a chocolate bar to my goods to push me over the £10! On a low value transaction such as this, there is a low profit margin, one going to be significantly reduced by the bank commission charges, so the principle seems fair. As venues you may have a 19p charge per card from your bank but the corner shop will most likely have a higher rate and may pay more for the provision of the terminal, so it is a fair figure there too. The rate of 2% is often quoted as the commission on credit cards, so that would be 20p for a £9.99 transaction, but again many merchant deals are based on x pence plus y%, so probably we are still fair. PRE-CONTRACT so available before we start the transaction, not revealed at the end. In many of the talks and seminars I have been to in the past six months on this subject, budget airlines seem to be blamed for “causing this” – **** air or ****jet, advertising a return ticket to Malaga for 25 pence only to reveal as we approach checkout that the price is subject to air tax, landing fees, passenger fuel duty surcharge, all of which you CANNOT AVOID, and then added cost options to have priority boarding, adding luggage etc, and even paying by DEBIT CARD saw us pay £6 per person per leg! So even though the airline was being charged 19p for our £400+ debit card transaction, they saw fit to impose £24 in fees, or in other words they saw a chance to make profit. Now in the main, EU regulations have forced the airline industry to clean its act up, so much so that I can be really annoyed when I find a bargain flight to the US, only to find out no taxes or fees are displayed. But in Europe at least they HAVE put their affairs. Presumably this is where we want our industry to get to? Two examples I like are below. EasyJet on their pricing grid show the complete price, and over on the right they highlight the price difference if you pay with a Credit card, again what we want to see. British Airways are again very clear on the total price, telling us at the final stages that it is made up of their fare, plus charges imposed on them, giving us a further chance to see how that figure is made up, always useful to know that standing in line at immigration in the US costs you £4.20! 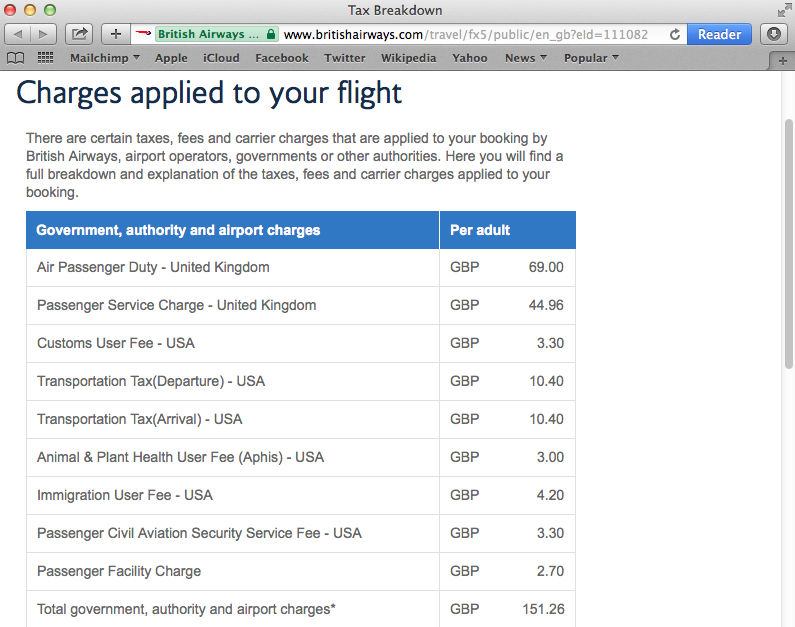 I did go looking but could not find any airlines (in the UK) that seemed to either breach regulations or mislead customers in the spirit of “what you see is what you pay”, but then I switched my attention to . . . . There does seem to be a massive amount of either confusion, apathy or just unwillingness to adopt the same practices as the Dog & Duck or Easyjet when I speak to venues, so I decided to see how bad it really was. 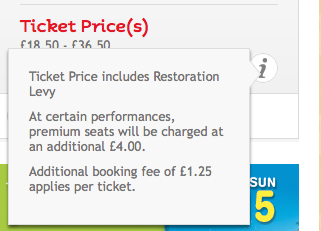 hang on – ALL tickets were subject to a £2 fee – so the tickets weren’t £18.50 were they? I went on a hunt for non compliant sites. The first one I found was more of a technicality, as it quoted prices in its Internet ticketing engine and then a pop up box stated a £4 extra premium charge at some times. Well that should all be in the from and to quoted price, with the most expensive tickets on the premium shows being the “top price”. But hang on – ALL tickets were subject to a £2 fee – so the tickets weren’t £18.50 were they? They were actually £20.50. Fair enough there was an explanation of this if I went on clicking, but the airlines don’t need a separate pop-up box, so why does the blank blank blank? Technically not compliant but a step in the right direction? I hit a fair few more, the Dominion with their presentation of Evita had a very CLEARLY laid out banner talking of seat levies and postage charges before I had even had chance to pick my seat, again, CLEAR, SIMPLE, PRE-CONTRACT. I was pleasantly surprised to see a number of venues with no transaction or booking fees at all. Yes, many were own productions and self-promoted, but good to see. Who knows? Perhaps the cost of the box office is now rolled into the promoter deal for some of the shows I looked at? That in itself is a massive step forward. So it is not that bad now is it, Andrew? So I didn’t find countless examples of venues not showing or even discussing prices until the basket. So if the only thing we do have to worry about is the application and being technically incorrect in how we display prices and fees, then we may be finally “getting the message” that the public want transparency, not to mention the regulators. I fear there are hundreds of other venues who are not doing it though, whether from choice, ignorance or because their system perhaps does not easily support it. The question is therefore not’ to fee or not to (display) fee’, but who is going to take the non-complying venues to task and when? Why do Venues Change Systems? The importance and urgency that suppliers give to identifying, fixing and releasing a patch to a bug all needs to be considered when evaluating their service level. Friday 13th bad day for ticket sales practices? They have been coming for some time, but Friday 13th June 2014 saw arriving into UK law the European Union Consumer Contracts (Information, Cancellation and Additional Payments) Regulations 2013. Europe-wide these fundamentally ban hidden fees and charges – no more drip pricing – and pre-ticked check-boxes on websites. Perhaps the more surprising one for some ticket offices will be the ban on premium rate numbers and lines which pay part of the call cost back to the seller – consumers must now be able to call directly on local rate phone lines where they only pay the basic rate. It may seem sad that many of these practices are part of the desperation on the part of venues to increase retained income as on-line sales have soared, and there have been a steady series of consumer protection measures to deal with the multiple ways customers are charged or additionally opted-in without their obvious consent. The UK Government hurriedly introduced regulations banning specifically named card charges for paying by debit and credit card in April 2013, if these charges were for more than the actual cost of processing. Now the legilsative push is for no hidden charges, so customers can see the full price they will pay before they start the purchase process. Inclusive pricing is starting to be a practice adopted internationally – StubHub and Live Nation have done so in the US – and @WhichCampaigns in the UK are continuing their action against agencies like Ticketmaster and See for charging excessively and having multiple charges including for ‘Print-at-Home’. Ironically, Ticketmaster is in the final stages in a long running Court battle in the US to compensate 50 million customers for order processing and convenience fees which were simply profit centres, despite being referred to as, for example, UPS “delivery charges”. This also means practices must change for options such as adding ticket insurance to transactions – no more pre-ticked boxes – and Round-Up donations must be an Opt-In. UK venues which had already changed their presentation of web donations at the end of ticketing transactions had in fact seen some increase in consent and the value of donations after providing explanataory information. Some ticket re-sellers may find themselves caught by the detail: Retailers will be required to provide certain prescribed information to a consumer before the consumer can be bound. Such information will include in particular: (i) the main characteristics of the goods; (ii) the identity of the trader; (iii) the total price of the goods/services (inclusive of taxes); and (iv) all additional delivery charges and any other costs. This seems potentially likely to inhibit some secondary market practices. It is also less clear how some of the new requirements for extended “cooling off” periods and for refunds will apply to ticket purchases made on-line. But one thing is clear: Consumer Protection regulations are steadily impacting on ticketing, joining action in the UK by the Advertising Standards Authority in a drive to inclusive pricing and the removal of excessive charges around ticket purchases. Venues are at risk of prosecution in two ways around the same issue: booking fees and how they are applied and presented. Venues need to act immediately to change their practices. There is increasing evidence that consumers are willing to make formal complaints when they see arts and entertainment organisations flouting the Regulations, as evidenced by the volume of specific complaints to the Advertising Standards Authority. As the result of a Class-action law suit in the US dating from 2003, Ticketmaster has to refund part of the processing charges it made on customers in the US where it intentionally made a profit over the actual cost – dating back from October 21, 1999 to October 19, 2011. Refunds will be .50 per order with up to 17 orders per customer. If the redemption buyativan.org falls below $11.25 million per annum during the four years for claiming, Ticketmaster will donate the balance to charity. Ironically, Ticketmaster can continue the over-charging practice if it explains that these are not just processing fees on its websites, but has to make the refunds on past transactions because it failed to explain to purchasers that these charges were for more than the cost of processing. Similarly, Court documents are reported to show that people who chose to receive ticket delivery expedited via UPS are eligible for a refund of $5. Refunds are expected to be claimable after April 2012. Consumer protection agencies have long been concerned in the US about how tickets are sold on-line and the basis for the multiple charges applied to ticket purchases on websites by the likes of Ticketmaster. Who would have thought that a Class-action law suit started in the US in October 2003 would come to fruition in 2011 and require Ticketmaster to give refunds to every US on-line purchaser from October 21, 1999 to October 19, 2011? The dispute over “processing-fees” has been running for a long time, and in the UK, both Consumers Association Which? and the Office of Fair Trading have queried whether the charges made for card processing, etc. actually reflect the true cost, and are proposing consumer protection action. Now a Court in the US has ruled Ticketmaster has to refund that part of the processing charges it made on US customers where it intentionally made a profit over the actual cost. The problem they have run into is very simple: they failed to explain to purchasers that these additional charges were not just “processing fees” but additional profit-making surcharges. If Ticketmaster complies and provides an explanation on its website of the charging practices, it can continue to impose the excess charge. You do wonder why it did not do so in 2003 when the Court action started, since that would have saved a huge sum. Similarly, where they charged more than cost for expedited delivery of tickets by UPS, it will be necessary to refund the difference. The latter is estimated at $5.0 while the “processing fee” refund will be $1.50 per order. Each customer can claim a refund for up to 17 orders, going back over 12 years. You have got to ask why it is not thought good practice to be open with customers and avoid any perception of “rip-off” in trying to get extra money from a simple ticketing transaction. There are lessons to be learned by venues everywhere about the need for honesty on why extra charges are being imposed. If the size of the refund and the administration of redemption was not enough, if the actual level of redemption falls below $11.25 million per annum during the four years for claiming, starting in April 2012, Ticketmaster will donate the balance to charity. More on the culture behind these business pactices in the fascinating story Ticket Masters by Dean Budnick and Josh Baron: The Rise of the Concert Industry and How the Public Got Scalped. Details on Amazon. The UK Supreme Court has ruled that secondary market ticket sellers must hand over to the primary seller the names of people who have breached the primary sellers’ Terms and Conditions by re-selling their tickets at inflated prices on secondary market sites. The UK Rugby Football Union won its case against Viagogo (now a Swiss company) to reveal the names of people who re-sold seats they had booked for its’ 2010 Internationals and the Six Nations Championship in 2011. The Supreme Court judgement on 21 November after the appeal on 14 June 2012 was in fact against Consolidated Information Systems Limited, the former UK firm known as Viagogo Limited, now in liquidation. The Rugby Football Union (RFU) stance is clear: there were supporters who wanted to buy tickets, and the RFU had set affordable prices, and they did not want those tickets sold at vastly inflated prices, but sold to their supporters at the set prices. The RFU plans to use the names handed over by Viagogo to “name and shame” the re-sellers and may take further Court action against individuals to recover the money. While Viagogo says only a a handful of names is involved, the RFU says thousands of tickets were sold on the Viagogo website in breach of their Terms and Conditions. The RFU says “appropriate sanctions will be handed down” including clubs and individuals having their seat allocations suspended or revoked, being named and shamed, or prosecuted to force them to return the profits they made from their tickets. The Judge in the case being appealed by Viagogo had also held that those who entered the stadium by use of a ticket obtained in contravention of RFU conditions were arguably guilty of trespass. The RFU is one of the few UK sporting bodies to take direct action over re-sellers who breach the Terms and Conditions of ticket purchase. Their ticket purchase procedures could not make the Terms and Conditions of purchase clearer. The Wimbledon Lawn Tennis Association, using their Terms and Conditions, in the past has simply cancelled as void any tickets advertised for sale on e-Bay or other secondary market sites. The Supreme Court ruling confirms the legal contract status of the Terms and Conditions of purchase and that purchasers are bound by these if they choose to buy the tickets. Perhaps reflecting their attitude to the law, The Guardian reported Viagogo spokesman Ed Parkinson saying “the resale of rugby tickets is still legal. Our data protection is now better, so fans may therefore now buy and sell rugby tickets on Viagogo with confidence that their information will be protected”. In fact the Data Protection Act in the UK does not protect identity in the case of legal proceedings, and the Supreme Court ruled that revelation was proportionate under article 8 of the European Union Charter of Fundamental Rights, so it is hard to see how Viagogo intends to evade the Supreme Court ruling. The Guardian reported that Viagogo was continuing to sell tickets at inflated prices for the England versus South Africa game at Twickenham, prices inflated up to £599. The UK’s Channel 4 investigative TV programme Dispatches revealed in February 2012 that despite the descriptions on their websites, fewer than 25% of the tickets sold on secondary market sites come from fans trying to re-sell tickets. Most come from allocations from the promoters, from “power-sellers”, from ticket brokers, and from staff making direct purchases from the likes of Ticketmaster. If they could not get enough tickets by those means, whenever necessary the companies were buying the tickets themselves, impersonating the public, using numerous credit cards registered at the home addresses of staff. If Viagogo says only a handful of names of fans are involved, the other sources could be pursued by the RFU. Viagogo moved from the UK to be a Swiss company, closing down their UK company, at the time of the investigation into their re-selling practices, when Dispatches’ under-cover reporters filmed their training of staff and advice to refrain from explaining the source of their tickets or even the seat locations. In Portsmough, the Police are also investigating the sale of fake tickets by Viagogo for a Mumford and Sons gig at Portsmouth Guildhall. The BBC reported hundreds of fans, some who had travelled from the US, had paid inflated prices for £23.50 face value tickets which turned out to be fakes and were refused on the door on Thursday 22nd November. Viagogo spokesman Ed Parkinson told the BBC that a handful of people had so far complained, and he promised a full refund.